This morning we woke up at 7 AM to start getting ready for our eventful day at SHARE Food Program. We had to be there by 8:30 AM so we hurried to get ready. When we arrived, we realized we were an hour early! While waiting for the coordinators to finish their meeting, we played charades. Finally, we were directed to the back of the warehouse where we constructed 1,400 boxes to pack food in. After that we made over 200 boxes of food to be sent out to families in April. 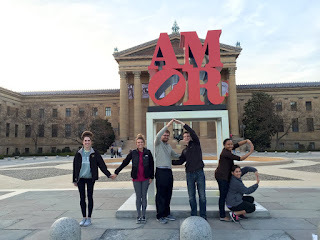 After volunteering all day we headed over to Philadelphia's Art Museum. There was so much to do there! Taylor and Julianna got their hair and makeup done 60's style, while others went around and admired the beautiful art work. We also went to the steps where the movie "Rocky" was filmed. We ran up and down the steps as they do in the movie and took lots of pictures. 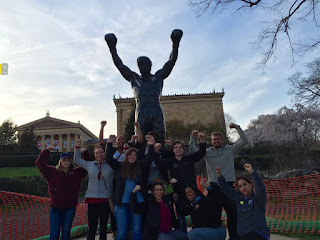 We also found the Rocky statue and took a very cool picture at it. After the art museum, we all were extremely tired from this long day. We came back and ate an amazing chicken Alfredo dinner cooked Taylor and Jessica. We then reflected on our busy day and went to sleep. Mizzou Alternative Breaks (MAB) sends groups of Mizzou students on student-led service trips during school breaks. Mizzou AB trips serve all across the country, from Florida to New York, Texas to South Dakota, and many places in between. Trips address a variety of issues, including HIV/AIDS, the environment, urban poverty, education, disability, and Native American issues. Help make our trips possible! Looking for a way to help make these trips possible? Visit our Donation page by clicking here to give. Copyright Mizzou AB 2014. Simple theme. Theme images by Josh Peterson. Powered by Blogger.